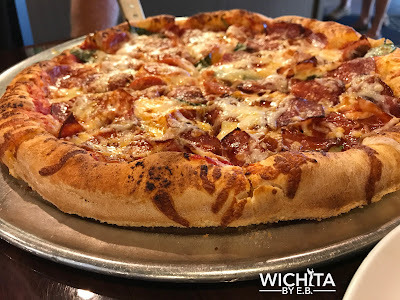 Knolla’s Pizza Review – Wichita By E.B. When discussing favorite pizzas in town, there’s one restaurant that is sure to get their followers coming out to make their voices heard. It’s Knolla’s Pizza. Started back in 1988, Knolla’s has been a local favorite for many years. Personally I have never eaten inside a Knolla’s location. Most of the time it’s always been carryout. When my brother lived with me years ago, he would often get Knolla’s to go. Those were the only times I would have their pizza. For the others in my group, they’ve had similar experiences with rarely having gone to Knolla’s. For us, it just never came up as an option. This week, that all changed. 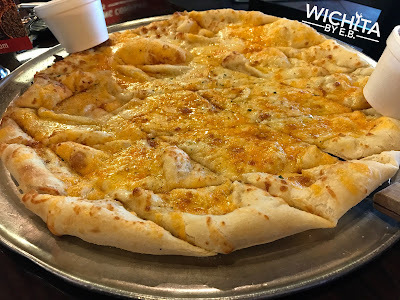 For this review, my friends and I visited the east Central location. On our visit to Knolla’s, we wanted to order an assortment of popular items from the menu that were suggested from the staff. We ordered bread sticks, cheesy bread, salads, and pizzas. 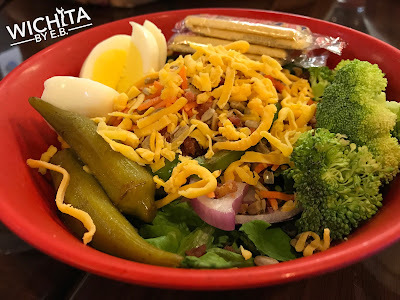 For a basic house salad, my friend said it was much better than other ones she’s had. They added various amounts of different peppers and vegetables beyond your lettuce and shredded carrots to make it a worthwhile house salad. Everyone loved the cheesy bread. The garlic butter, mozzarella, cheddar cheese and sprinkled garlic salt over the hand pressed New York style dough was a hit for all those involved. I absolutely loved the bread sticks. They reminded me of Little Caesars minus the garlic. 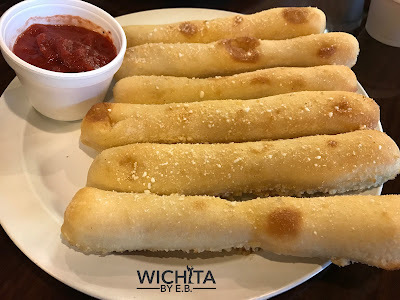 I could have simply eaten the bread sticks for dinner and left a happy man. For our pizzas, we stuck with four different pizzas all ordered New York style. For the record, if you like Chicago style, you can order your pizzas that way. There was that moment of silence you could tell everybody was too busy enjoying their pizza to say a word. One thing we did notice was that the crust was thicker than some of the traditional New York style pizzas. I’ve had some authentic ones in NYC and there was a stark difference; my friend felt the same way saying it wasn’t “foldable and thin….and greasy”. Regardless that didn’t bother us. How it tasted was more important. The hands down favorite of all the pizzas we ordered was probably the ICT Pizza. It consisted of bacon, BBQ, minced garlic, basil, beef, onions, sunflower seeds, Parmesan cheese with a garlic butter crust. 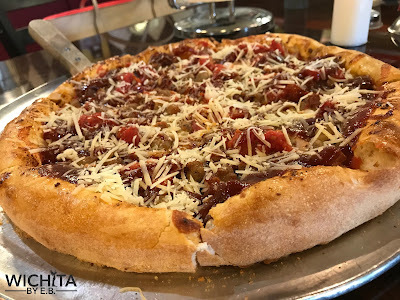 One friend loved how the BBQ sauce on top of some of the traditional pizza toppings provided an interesting savory and sweet pairing. The Buffalo Style Chicken pizza was interesting. 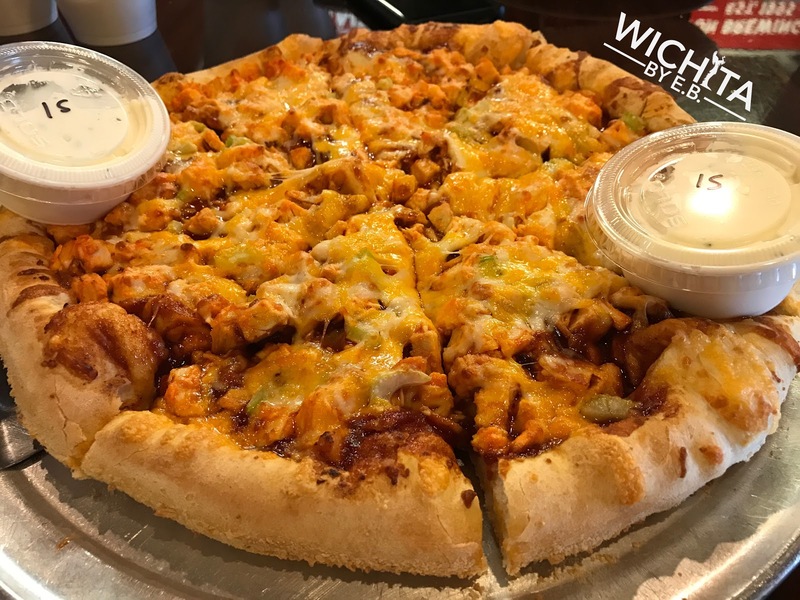 We should have looked at the menu closer because we weren’t expecting BBQ sauce on the Buffalo Style Chicken pizza. Regardless, the BBQ flavor was very subtle in it. As for the Works if you ever feel supreme pizzas rob you out of toppings, go check out Knolla’s. They load it with toppings like it’s going out of style. The sausage really sticks out and packs a lot of flavor. My friends were in awe in the copious amounts of ingredients spread over the top. For the final pizza which was a custom order of pepperoni, salami and spinach, I asked my friend how he and his girlfriend liked it and he responded simply, “Loved what we got.” Had I purchased him a few drinks which they do serve at Knolla’s, he probably would have talked my ear off about how much he loved it. Nevertheless, while sober he’s a man of a few words when describing food. As a way of thanking my friends for joining me on this latest food adventure, I purchased some cookies to share. 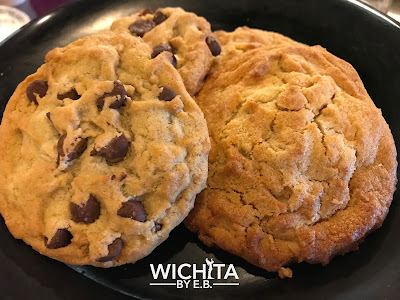 Knolla’s makes all their cookies at the restaurant. That particular day they had peanut butter and chocolate chip. We’ve never had angels come down from heaven and bake us cookies but if they did, Knolla’s must have hired them. To quote one person, “the cookies were freaking amazing!” Soft, melt in your mouth, delicious, wonderful……those would all be terms found in a reference book as synonyms for Knolla’s cookies. Not sure we could have ended our dinner any better. The service couldn’t have been any better. There were two ladies taking orders, delivering pizzas, cleaning tables, and checking on customers. Restaurant employees could learn a thing or two on hard work and customer service from them. Everyone walked out of Knolla’s with a smile on their face. If they didn’t, it was because they were stuffed. For years, I’ve wondered why so many people have put Knolla’s extremely high on their list of favorite pizza places and I now know why. 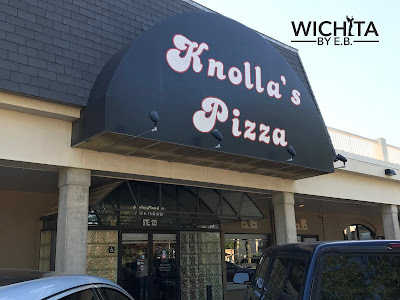 Knolla’s offers their own style of pizza that can’t be found at other favorites like Picasso’s, Il Vicino or Piatto. 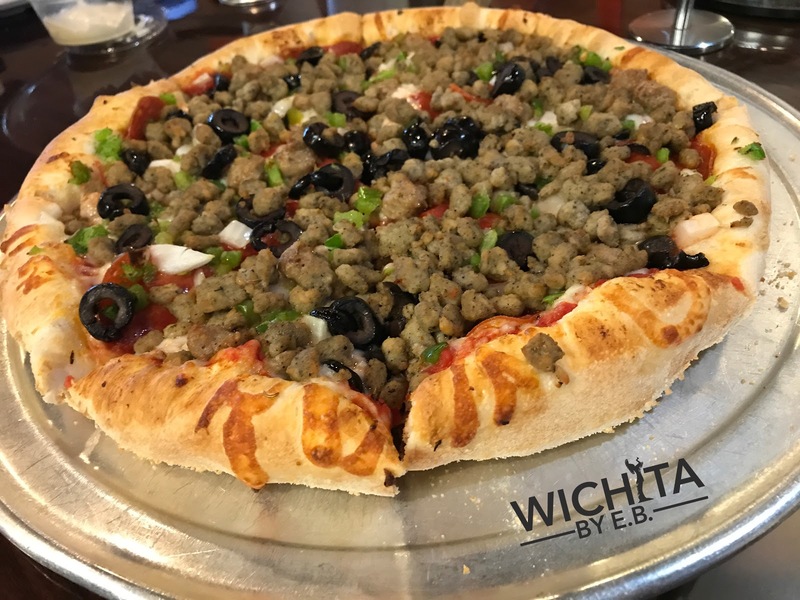 It’s great to see that while there are so many pizza options in Wichita, all the great places have their own tweaks to make themselves special. 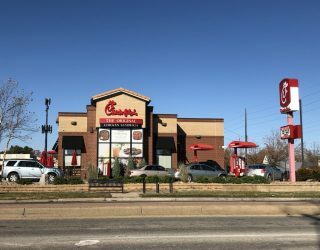 I want to thank my friends for joining me on this latest blog including Breana who was with us on her first review with us.